This section presents information on our events. Read the latest news about our group's activities, both in Tring and across the globe. 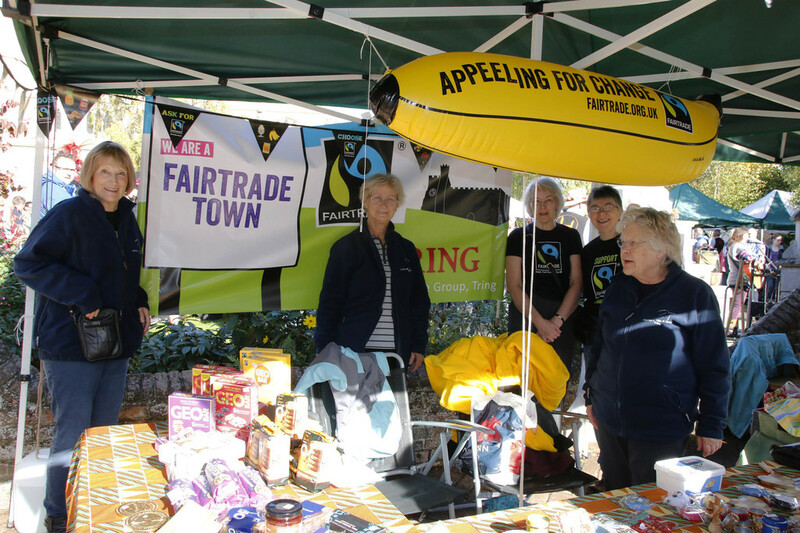 The Fairtrade Stall at the Farmers Market on 9th March 2019 highlighted where Fairtrade Produce can be purchased in Tring. Members of the Justice & Peace Group showing shoppers the Fairtrade products that are for sale in Tesco's Tring. Look out for the Justice & Peace Group Stall at the Tring Farmers Market on 9th March 2019. 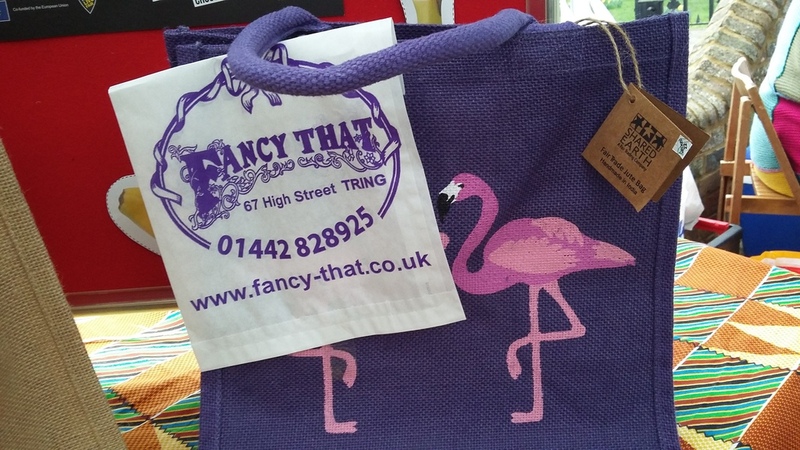 We will be showcasing the wide range of Fairtrade products that are available in Tring. Come and have a look. 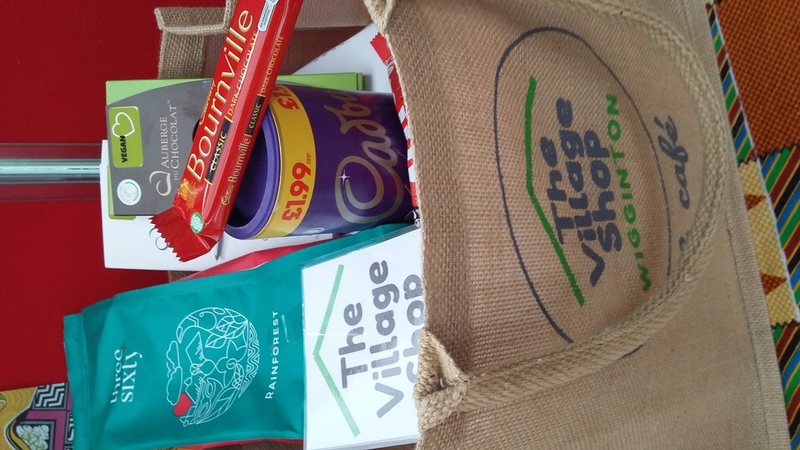 You can also pick up a guide to where you can purchase Fairtrade products and Local Produce in Tring and the surrounding villages. The Holocaust Memorial Day Trust published a flow chart which visually demonstrated the ten stages of Genocide. Genocide never just happens. There is always a set of circumstances which occur or which are created to build a climate in which genocide can take place. These stages may occur simultaneously or in a different order. Stage 1. Classification: Differences between people are not respected. There is a divison between 'us' and 'them'. Stage 2. Symbolisation: A visual manifestation of difference. Certain groups are forced to wear symbols to mark their difference. Identifying them as objects of blame and hatred. Stage 3. Discrimination. The dominant group denies civil rights to certain groups - treating them as lesser citizens or non citizens. Stage 4. Dehumanisation: The denial of basic human rights by viewing certain groups as not human. Stage 5. Organisation: Genocides are always planned and often regimes of hatred will train and incite those to carry out the destruction of certain groups. Stage 6. Polarisation: Propaganda in the media is used to increase hatred of certain groups - to blame them for the ills of society and problems in the country. Stage 7. Preparation. The term Genocide is never used by the regime - instead the planned destruction of a certain group of people will be disguised under a euphemism such as the Nazis' Final Solution. Stage 8. Persecution. Certain groups will be separated from the general population and death lists will be drawn up. Stage 9. Extermination. Identified victims are murdered in a deliberate and systematic campaign of violence. Stage 10. Denial. The perpetrators or later generations deny the existence of any crime. Evidence is destroyed and witnesses intimidated. 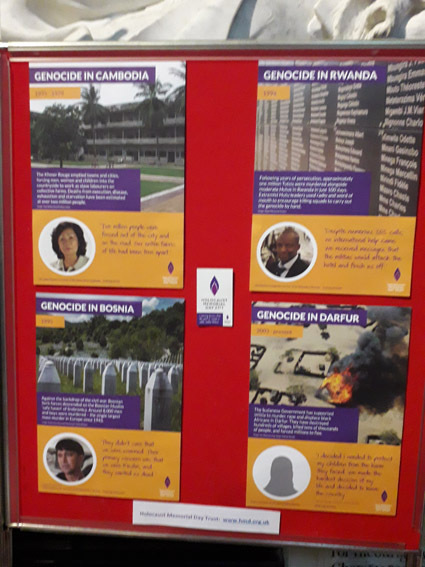 Recent Genocides: Cambodia, Bosnia, Rwanda and Darfur. Do any of these stages ring any bells today? Even in your own country? Very many thanks to everyone who supported the Bumnotes Concert and especially to all those who helped on the night. 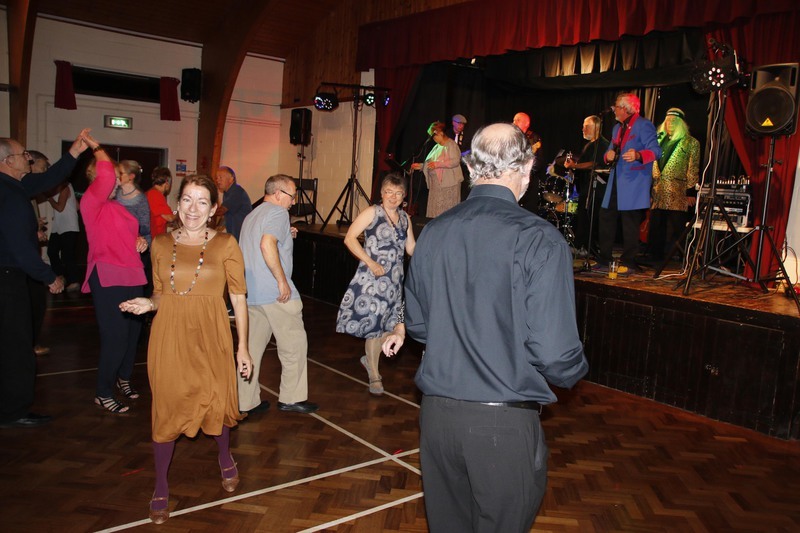 The event was very successful and we raised £1049 which together with a contribution of £200 from the Bumnotes means that £1249 will be divided equally between the two charities Medecins Sans Frontieres and The Pepper Foundation. Robert Breakwell, Founder and Patron of the Pepper Foundation has said that he enjoyed the concert and that he was amazed at the sum raised. Schoolaid is based near Beaconsfield, has been operating for about 20 years and distributes books to schools in Africa. On-the-ground project officers working for Schoolaid work closely with schools to get libraries and reading schemes working efficiently. Schoolaid needs reading books and reference books for all school ages, ranging from first readers through to young adults. Over 100,000 books are going to libraries every year thanks to this charity’s work. Members of the Justice & Peace Group helped out at the Traidcraft stall at Tring Carnival on 23rd June 2018. A range of Fairtrade goods was offered for sale and Fairtrade literature was available too. Almost 70 people took part in the Grand Pudding Quiz, organised by the Justice & Peace Group, affiliated to Churches Together in Tring, with net proceeds going to the Watford & Three Rivers Refugee Partnership. The team at each table gave itself a name and the answers to the quiz questions were exchanged with different teams and marked before being handed in. At half time there was a break to sample the delicious puddings, made by members of the Justice & Peace Group, many of the puddings having been made with Fairtrade ingredients. This was the time for a short resume of the work of the WTRRP and for the raffle. The quiz then resumed, and after a nail biting finish ‘The Jolly Mixtures’ were announced as the winning team and were rewarded with Fairtrade chocolate bar prizes. The raffle was then drawn, the prizes having been generously donated by local businesses. The evening had been a tremendous success and an opportunity for publicity for the excellent work carried out by the WTRRP. £683.02 was raised on their behalf. On 23rd April 2018 Michael Demidecki, Secretary to the Justice & Peace Group, was honoured by being awarded Tring Town Council's Community Award at the annual meeting of the Tring Town Council. He was presented with a Peace Lily by the Mayor of Tring, Councillor Gerald Wilkins, and later received a cheque payable to the Justice & Peace Group. The award was for his contribution to the community life of Tring in his capacity as Secretary of the Justice & Peace Group, affiliated to Churches Together in Tring. Michael said afterwards that he had accepted the award on behalf of the whole Justice & Peace Group and not just himself. He added that the award was a complete surprise and that he was somewhat lost for words when his name was announced as recipient at the meeting. 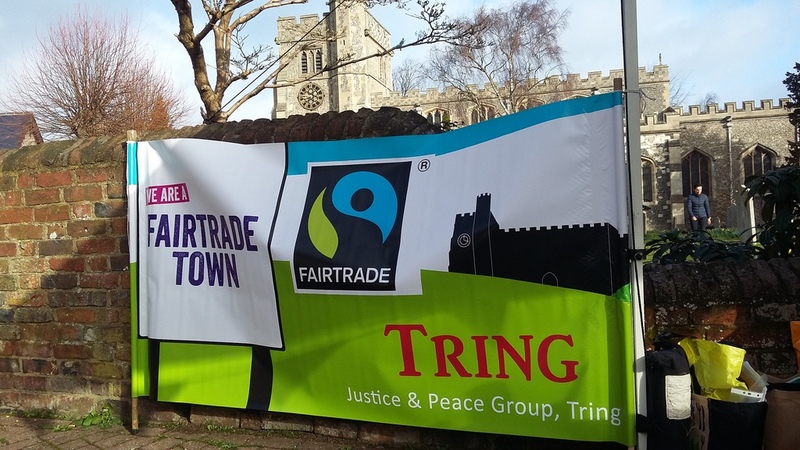 To mark Fairtrade Fortnight the Justice & Peace Group organised a Pop Up Cafe in the foyer of the High Street Baptist Church in Tring on Saturday morning. 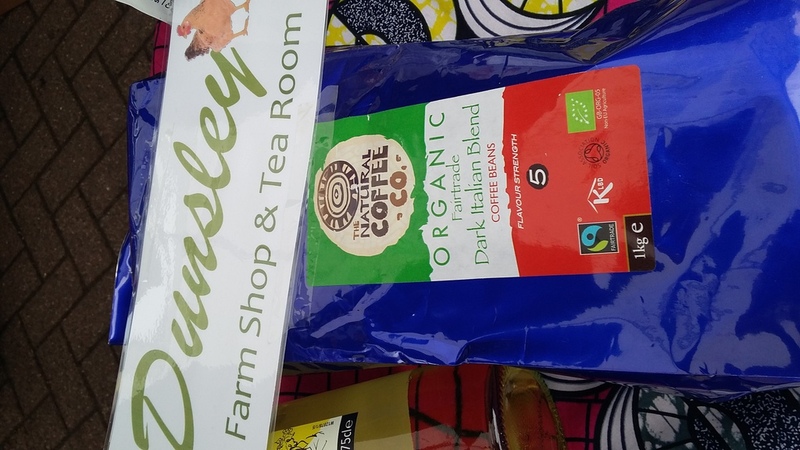 Free Fairtrade Coffee and Tea were on offer as well as a selection of home made cakes using Fairtrade ingredients. There was a traidcraft stall full of fairtrade goodies to buy. We thank Marks & Spencer, Tesco and the Co-op for their support and High street Baptist Church for providing the venue. Our thanks also to all who supported this event including our Mayor, Gerald Wilkins. Katy Chakrabortty, Head of Advocacy at Oxfam, will be speaking about Oxfam’s Campaign “Even it up” to oppose extreme inequality. The talk follows the Churches Together AGM and starts at 8pm and ending 9pm. The venue is St Peters and St. Paul’s Church in Tring High Street. All across the UK, Holocaust Memorial Day is marked by thousands of people who come together in schools, workplaces and public spaces. 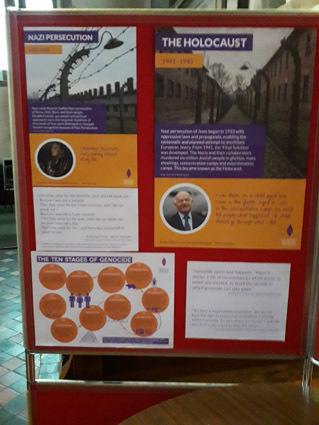 By pausing together to reflect on the appalling events of the past, those who mark Holocaust Memorial Day (HMD) commit to creating a safer future. From candle lightings and peace walks, to tree planting and poetry writing, HMD activities involve all members of the community. Whether activities are big or small, public or private, online or in person, they all play a vital role in marking Holocaust Memorial Day. On 27th January find out how you can play your part in learning the lessons of the past to create a safer, better future for all. This was the seventh year that the Justice & Peace Group have organised this Christmas event in Tring. This year's concert was held in the presence of the Mayor of Tring, Councillor Mr. Gerald Wilkins, and other dignitaries. The audience was treated to wonderful singing by Dundale Primary School Choir led by the wonderful Kate MsKenna on the keyboard and by invited guests, Cassie Emmott and Lucy Ashby. The Revd Jane Banister was our compere for the evening. 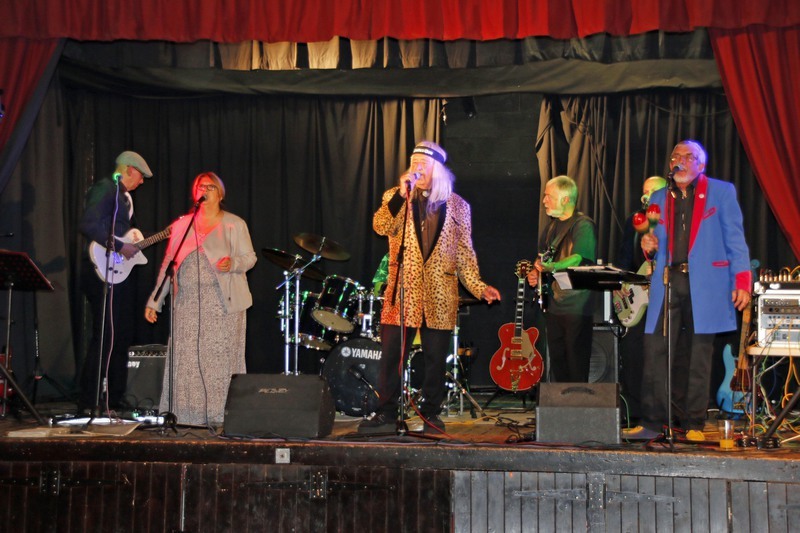 Thank you to everyone who supported this concert held in aid of Age UK Dacorum. The concert opened with a school choir soloist who sang beautifully the first verse of ‘Once in Royal David’s City’, after which the audience joined in the remaining verses of this well known, and moving, Christmas carol. Then the school choir sang ‘The Chattanooga Choo Choo’, ‘Paradise’ and ‘Ain’t No Mountain High Enough’, their music teacher Kate McKenna accompanying them ably on the keyboard. Our guests Lucy Ashby and Cassie Emmott, accompanied by Kate McKenna, then entertained us with a beautiful rendering of ‘Emmanuel’ (by Reuben Morgan). After the audience then sang together ‘While Shepherds Watched’ there was an interval during which Fairtrade refreshments were served. It was then the turn of Melanie Clarke to give a short talk about the work of Age UK Dacorum and the Cogs Clubs. Then there was more music, with the school choir singing ‘Winter Wonderland’, Silent Night’ and ‘All I Want for Christmas is You’. Our invited guests Lucy Ashby and Cassie Emmott then sang ‘Unto Us’ (by Reuben Morgan and Ben Fielding) and then after we had all sang ‘O Come all Ye Faithful’ it was time for us to go, but not without Revd Jane Banister first announcing to the audience the amount raised by the event for Age UK Dacorum which turned out to be the respectable sum of £653.60. If you would like to know more about these issues, International Justice Mission UK are holding a conference, entitled national Prayer gathering, on Saturday 4 November at St Paul’s Hammersmith (see http://www.ijmuk.org/npg). Esther Swaffield-Bray, a former Tring School student, is IJM’s Regional Development Executive for the North of England and she will be one of the speakers. 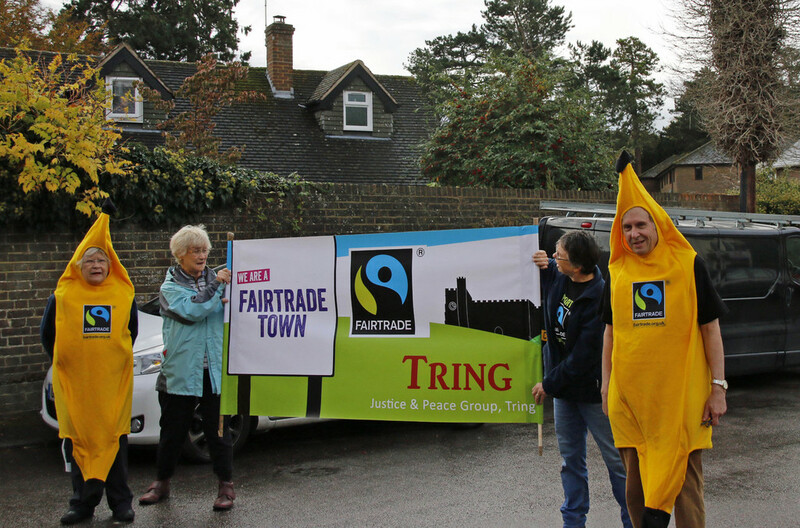 'Use your LOAF, choose Local and Fairtrade' was the title of the talk given by Michael Demidecki, Secretary of the Justice & Peace Group, Tring at the recent ECO Fair. To read a transcript of Michael's talk please download the PDF below. The Justice & Peace Group took a stand at the recent Eco Fair held in the High Street Baptist Church Hall. The Eco Fair was organised by the ‘Tring in Transition’ Group. The Justice & Peace Group thanks Beechwood Fine Foods in Tring and John's Lane Farm, Ashley Green for their support. There were a number of interesting stands – from Riverford Organics to bicycles from Tring in Motion. The Repair Shed had an interesting stand where pallets are turned garden and home furniture. This local charity helps retired men have a place they can go to where they can make new friends and feel less isolated. UNICEF estimates that more than 8 million children worldwide are growing up in institutions, away from the love and care of their families. Poverty is one of the main driver of this separation. Poverty means many children enter orphanages where there is a lack of individual care and children can become cut off from the world. 80% of children in orphanages are not in fact orphans but have families. There are also many illegal homes (outside the Government Registered List) with no monitoring or safety checks, where children are highly vulnerable and live outside any duty of care system.They are more likely to fall victim to abuse and crime. One Sky Foundation establishes community based services to support poor families and the lives of millions of children. In 2016 One Sky worked with 170 families, supporting cases involving 342 children and 220 adults, and we have just 11 staff. The charity ‘Children at Risk in Asia’ (CARA), based in Berkhamsted, Herts supports One Sky. Apart from donations, good quality clothes (suitable for children aged 3 to 10) and toys too are always gratefully received by CARA. The annual Grand Pudding Quiz held on Saturday 9th September 2017 is proving so popular that it was completely sold out within a few days of tickets going on sale. The Quiz was held this year in support of the Watford & Three Rivers Refuge Partnership. The event raised £601.09. A big thank you to all the guests who supported the event, those who made delicious puddings and those who helped to set/clear up. Thank you to The Akeman Restaurant for their raffle prize of a meal for four and Altered Image hairdressers for their Restyle Voucher. The Winning Team, captained by Annabelle Halliday, won by one point in a closely fought contest. Tremendous fun was had by all judging by the amount of laughter heard throughout the evening. 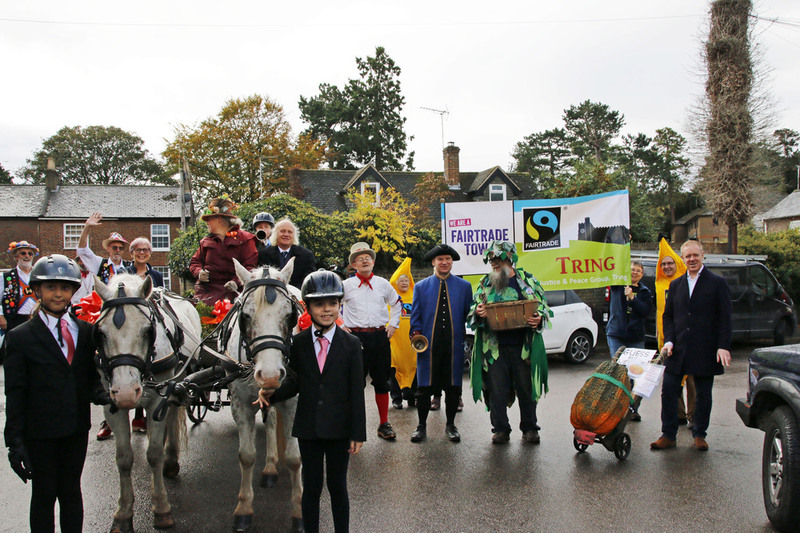 The Fairtrade Foundation has granted Fairtrade Town status to Tring until May 2019 and they congratulated the Justice & Peace Group on the work done by the group to increase the profile of fairtrade in the town. 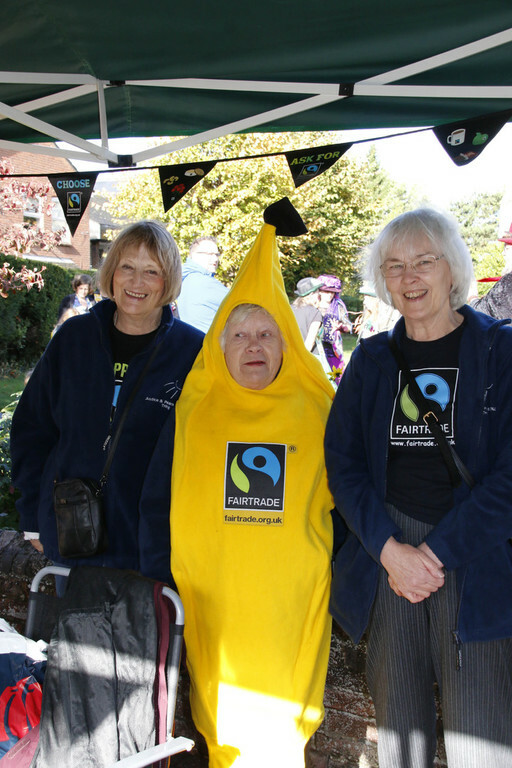 'We have enjoyed hearing about everything that you have achieved since your town last renewed Fairtrade status. It is clear that a lot of time and energy has been put in to make Fairtrade a part of the community, so we would like to pass on our congratulations and say thank you to everyone who has been involved'. 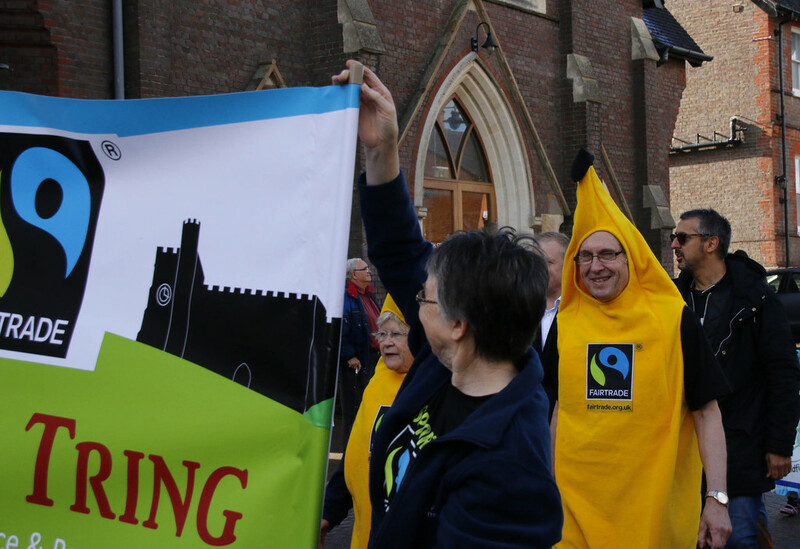 To mark the Fairtrade Fortnight we organised a coffee morning at High Street Baptist Church in Tring. Fairtrade coffee, Fairtrade tea and Fairtrade fruit juices were the refreshments on offer for the thirsty Saturday morning shoppers. There were delicious homemade cakes for those who in need of a bit more sustenance. There was a good display of Fairtrade posters and leaflets as well as the free 'Guide to Fairtrade and Local Produce in Tring'. Approximately 50 people dropped in to the event and the locals were so impressed they wanted to know if we could make it a regular event! Tring came together on Saturday 3 December for the annual Community Christmas Concert held in the Victoria Hall. The Mayor of Tring, Councillor Mike Hicks, opened proceedings by welcoming everyone to this annual event. The Reverend Andrew Openshaw was the Compere for the evening and led the audience in a pray in memory of Reverend Sarah Eynstone, the vicar for Aldbury, who passed away suddenly two days before. The talented young musicians of the Tring School Swing Band were joined by the Choir from Bishop Wood Church of England Junior School to provide a wonderful night of festive entertainment. Tring School’s Swing Band played a mix of both festive numbers and classics, and following their success at the recent Festival of Fire, the band did not disappoint! They performed a superb set and got everyone dancing in their seats with tunes such as ‘That Man’ and a refreshing take on ‘Jingle Bells’. Credit to all members of the band, especially soloists Amy Behan and Nathan Gunaselvam, who also arranged several of the musical numbers. The Christmas Concert has in recent years been organised by the Justice & Peace Group and has raised money for several good causes at home and abroad. This year is no exception with the net proceeds of the concert going to CARA, Children at Risk in Asia. Colin Lillicrap, from CARA, spoke at the Interval about the work of the group in Thailand and Myanmar (Burma). CARA is run completely by volunteers which means every pound donated goes straight in supporting the work of the Charity in these countries. Colin, along with other volunteers from CARA, also had beautiful crafted gifts for sale at the concert – so Concert Goers also got a chance for some impromptu Christmas shopping. Fairtrade refreshments of fruit juice and special Christmas Cookies were served at the Interval and they were particularly enjoyed by the many children who supported the event. Kick off the festive season in style by joining in a community celebration of the beginning of Advent. You can purchase your ticket from Beechwood Fine Foods, 42 Frogmore Street (price £5 for adult and £2.50 for child). This year musicians from Bishop Wood C of E Junior School and Tring School will be performing and there will of course be community singing too. Fundraising at the concert will be for the registered charity Children at Risk in Asia. The concert is being organised by the Justice & Peace Group, Tring. The rain held off just long enough for the residents of Tring to enjoy tea and cake at the Queen's 90th birthday tea party held in the grounds of St Peter and St Paul's Church. 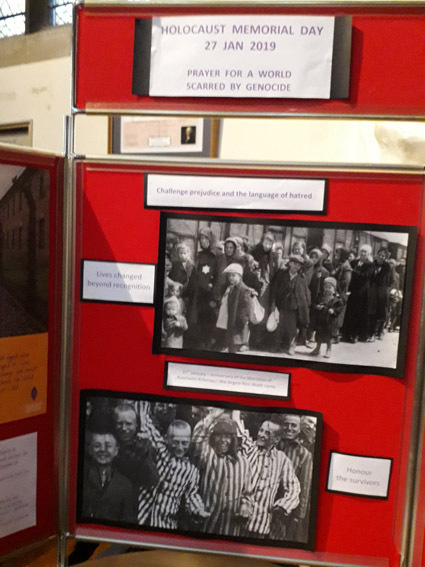 Organised by Tring Together, the Justice & Peace Group were invited to set up a display of the group's work in the church. We also ran a fun quiz on how much the residents of Tring knew about the Queen's life - the answers were placed in a 'top secret' envelope on the Justice & Peace Display. To mark St George's Day, a concert was held in Corpus Christi Church on Saturday 23rd April. An amazing line up of local talent, from a magician to a singer songwriter, entertained the audience with very high quality performances. 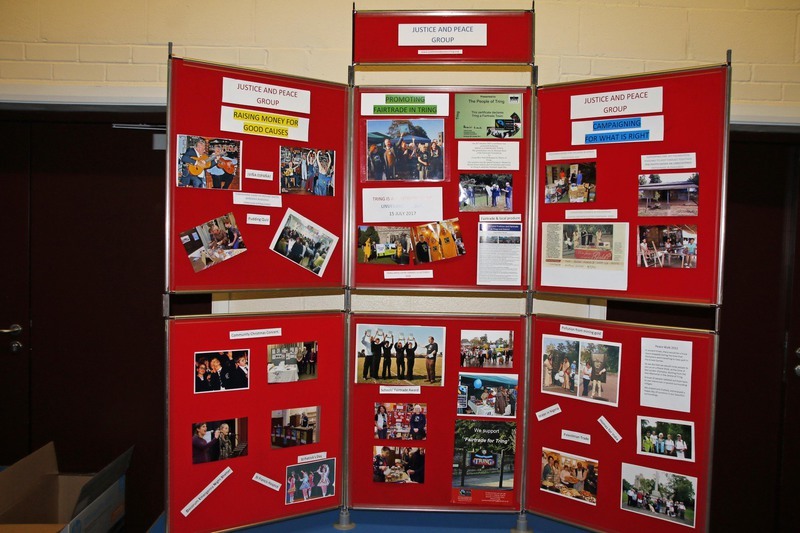 The Justice & Peace Group supported the event and also set up a display of what the Group does. 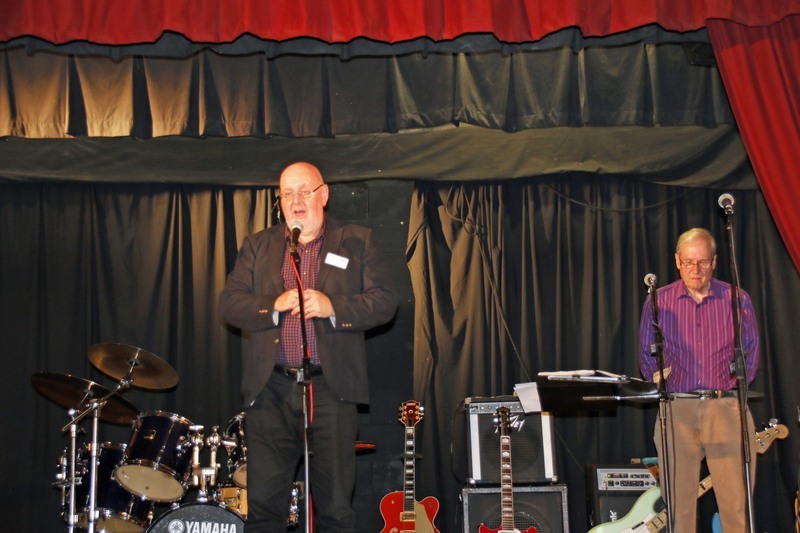 The concert was in aid of the local Swan Youth Project. The Justice & Peace Group took a display space at the EcoFair in Victoria Hall, Tring. 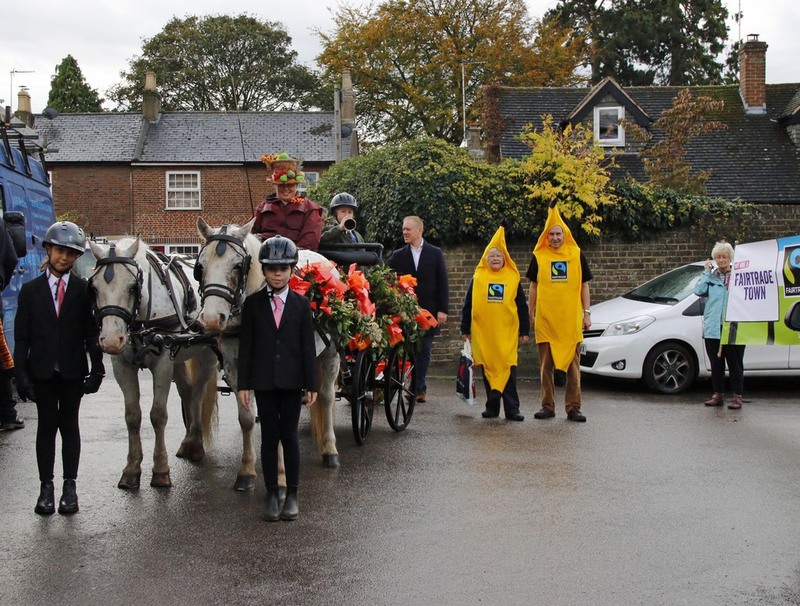 Our theme was make 'your breakfast local and fair' - so that we combined support for local producers with the campaign for this year's Fairtrade Fortnight. There were a lot of great examples of local crafts and local produce as well as some amazing upcycling. Of note was Sewing Seams Easy where you can learn how to give second hand clothes a new life as something else. There was also intersting stalls for pallet and cardboard upcycling. It was amazing to see the creativity on display. On 5 December 2015 the Community Christmas Concert was held at the Victoria Hall in aid of the Sethule Orphans Trust based in Zimbabwe. The Concert featured the Tring School Swing Band and the recently formed Franciscan Choir of children and their mothers. Canon Berry from Corpus Christi Church was the MC for the night. The quality of the music and singing was fantastic and the audience joined in for several rousing carols. Speakers from the Sethule Trust gave a talk about the work of the Trust. 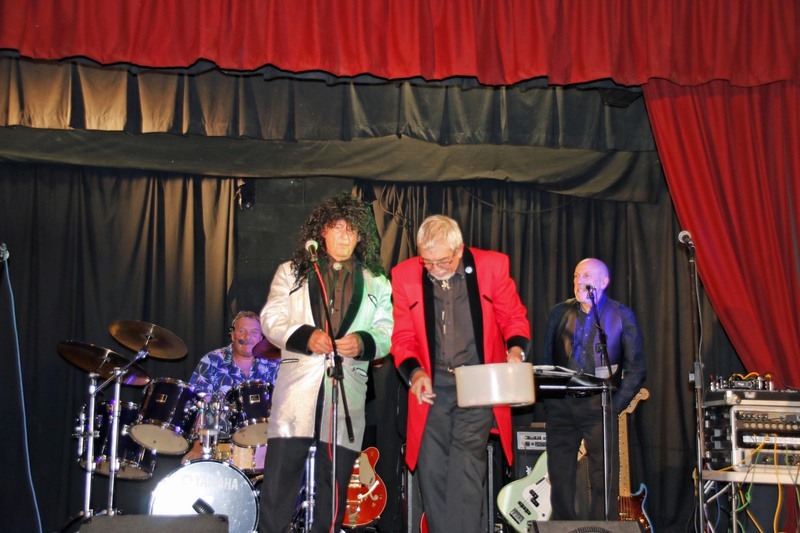 Including Gift Aid, the concert raised over £900 for the Trust. Thank you to all who supported the concert. 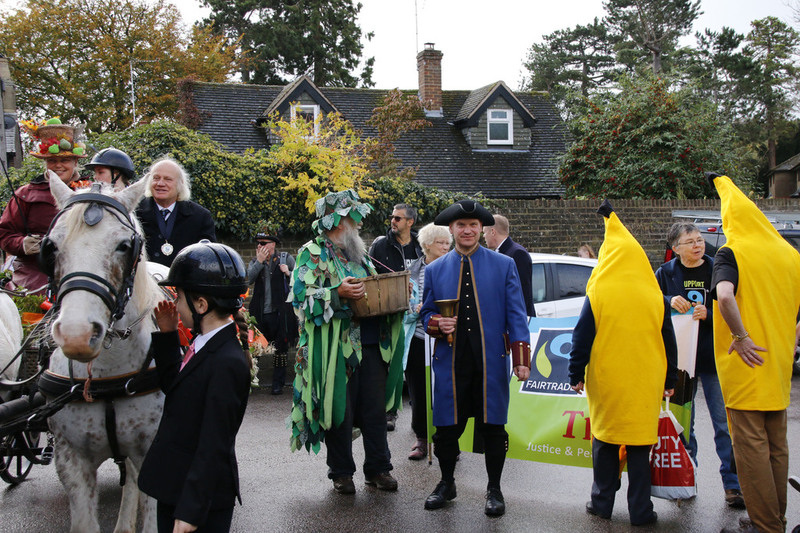 The Justice & Peace Group hosted a stall at the annual Apple Fayre held in Tring on 10 October 2015. The big attraction was the ' Taste the Difference Chocolate Challenge' where Tring citizens 'blind tasted' Fairtrade Milk and Plain Chocolate against non Fairtrade choclate. They were asked which they preferred. The great news is Fairtrade Milk and Plain Chocolate (from Divine) was preferred by the majority of testers. Thank you to all who attended the Grand Pudding Quiz held in support of the Justice & Peace Group's work. Everyone agreed that it was tremendously good fun and the 'Pudding Buffet' was very delicious. Questions for the panel from Justice & Peace Group, Tring. The Government is to be congratulated for committing 0.7% of GDP to overseas aid when budgets have been so hard pressed. Question: Will you seek to maintain the current percentage of GDP given in overseas aid? We know that caring for the planet involves concern for the environment and protecting the livelihoods of the poorest people in the world. Question: What is your view in tackling climate change and supporting sustainable development? The legal framework of the Equality Act 2010 aims to protect the religious and other freedoms and equalities of individuals. Cases where these freedoms and equalities may be perceived as coming into conflict with each other have received media attention- for example over the right to wear religious symbols. Question: Should the Government keep freedom of religion or belief as a human rights priority? If so, how can we ensure that the UK is an outspoken defender of freedom of religion or belief? Question: Do you agree that religious education should be an important part of the school national curriculum? Question: Where do you stand on benefit sanctions? Question: Do you support increasing the current minimum wage to a living wage? Question: What are your thoughts on the lack of social justice leading to inequality as an underlying cause for social unrest? Question: Do you believe the existing gap between the rich and the poor should be addressed and if so what are your proposals?2015 General Election Hustings on 16th April 2015 at Tring School. 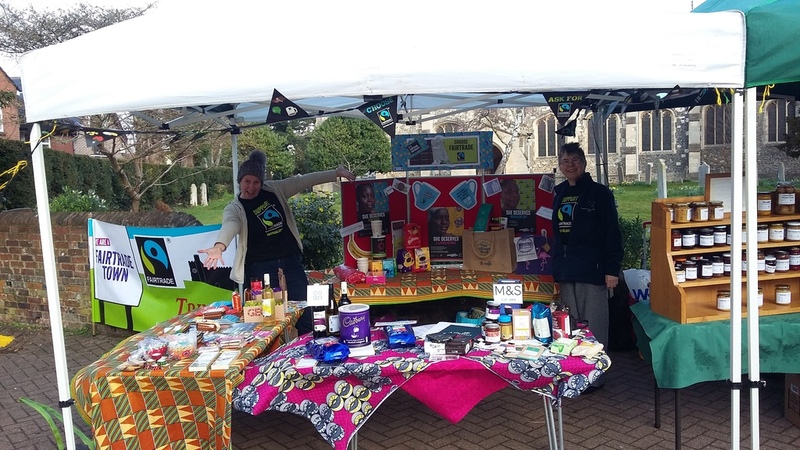 The Justice & Peace Group organised a stall on Saturday morning, 28th February (outside St Peter & St Paul’s Church) to mark Fairtrade Fortnight and we had a fun ‘taste the difference’ theme between Fairtrade and non-Fairtrade chocolate. So more people preferred both FT Milk and FT plain chocolate and 13% couldn’t tell the difference. (2) the Fairtrade premium, a little extra money to invest in their business, or in community projects of their choice. 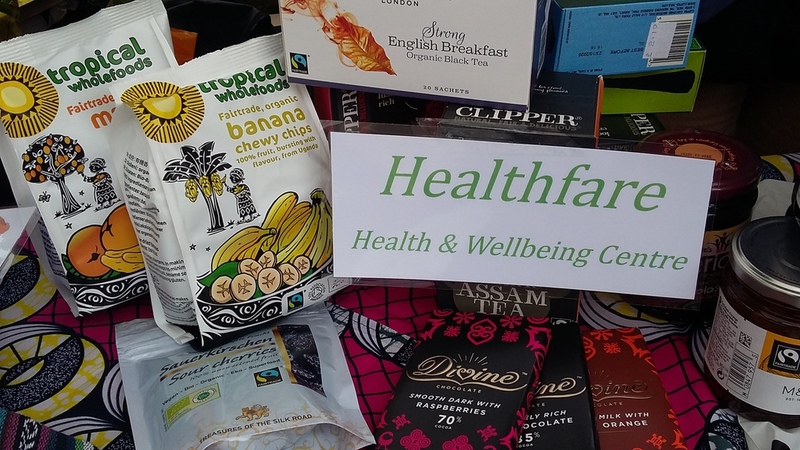 A big thank you to the residents of Tring who took part in our taste the difference survey on Saturday 28th February.Testers were asked if they could taste the difference bwteen Fairtrade and non Fairtrade chocolate and if yes, which they preferred. We had lots of testers and the results of the survey will be published shortly. Here are some photos of our stall on the High Street. 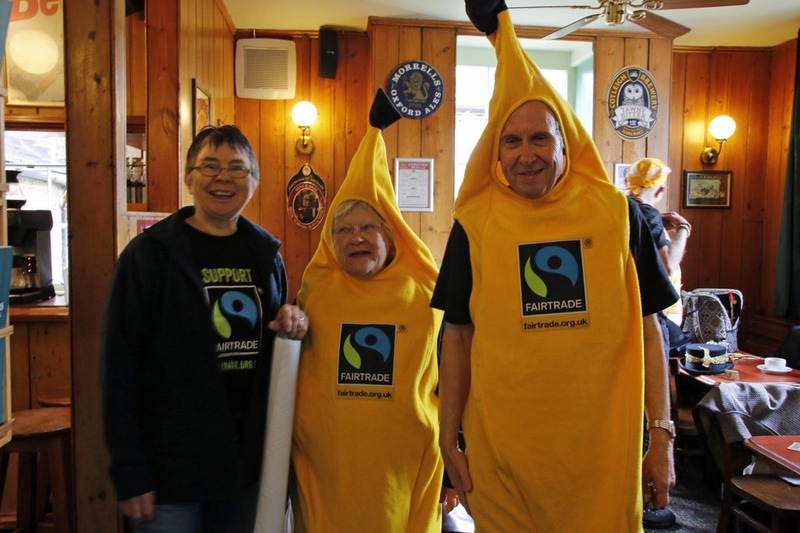 Fairtrade Fortnight 2015 – 23 February to 8 March. This year the theme is ‘the power of everyday choices’. It is a reminder about how we can make a difference to the poverty and inequality of opportunity in the world by buying products showing the Fairtrade mark in our everyday grocery shop. Choosing a Fairtrade cuppa can mean clean water for a community. Thank you to all who supported the Community Christmas Concert organised by the Justice & Peace Group held on Saturday 6th December. The choir from Bishop Wood School sang beautifully and the London Heritage Brass Quintet got everyone in the mood for Christmas. 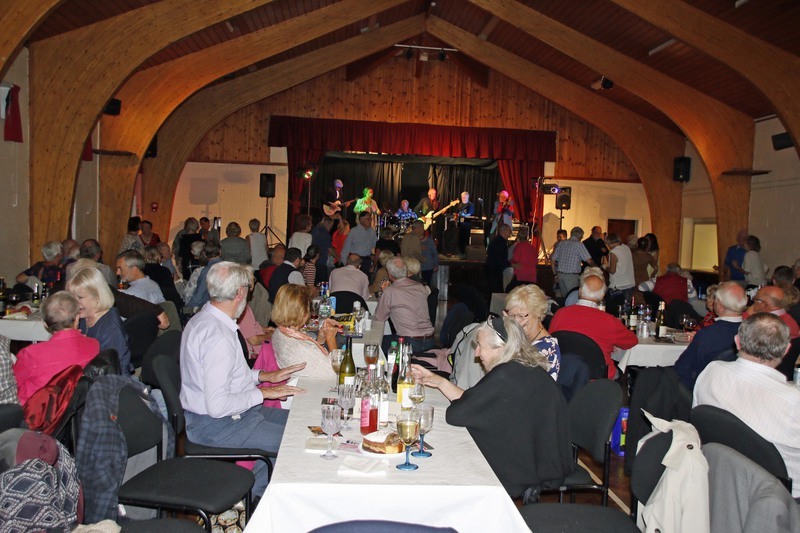 The concert raised £1,460 for the work of DENS (Dacorum Emergency Night Shelter), the local charity who run the local Foodbank – they receive regular and generous donations of food but are in need of financial support to run the Foodbank. On Saturday 25th October Tring held its special Apple Fayre Farmers Market, which showcases the very best of local produce and crafts. The sun shone and the Morris Dancers were in fine form, as the residents of Tring purchased local delicacies and sampled the Millwhite cider. We also had a Traidcraft stall run by Moira Hargreaves who was ably assisted by members of the Justice & Peace Group. 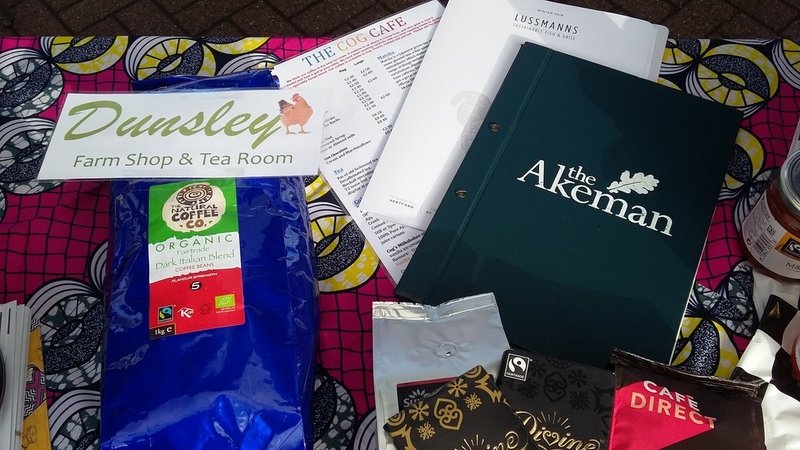 The Farmers Market is held in Tring every fortnight and if you want to try the very best locally produced food and drink that is where you will find it. Look out for the signs that publicise when the market is running. Meet Alastair Blake, a very talented potter who makes beautiful jugs, bowls and jars using our very own Chiltern Hills clay. Alastair can be found at the Matthews brick yard at Bellingdon. Nick Swain produces beautiful metalwork at his smithy at Dunsley Farm, Tring. Go and visit his forge to see the crafted and unique pieces. Primary School category: Horbury Bridge CE Junior & Infant Academy (Wakefield, Yorkshire). The pupils at Horbury Bridge wrote a magazine and interviewed their MP, resulting in letters from several MPs including Yvette Cooper, Ed Balls and Ed Milliband. Secondary School category: Imberhorne School (East Grinstead, West Sussex). Skelton Primary School (Cumbria) and Westray Junior High School in Westray, Orkney (a combined nursery, primary and secondary school) were both highly commended. The winning schools each receive £350 from the Fairtrade Foundation and an engraved trophy from the Justice & Peace Group, Tring. Several members of the Justice & Peace Group signed a letter drawn up by Margaret Whiting concerning the treatment of young immigrants to this country when they reach the age of 18. Although there are occasions when young people do not get sent back to their own country because conditions are regarded as being too dangerous, a number of young people are sent back each year, even when they may be about to take their 'A' Level, or equivalent, exams at schools in this country. Although it was acknowledged that if this policy were to change there could be unscrupulous parents in some underdeveloped countries who might send unaccompanied children to the UK so that they could be educated at our expense, there was a plea 'that those young people who are coming up to the age of 18 and are taking 'A'Level exams should be allowed to take them before having to leave this country'. This letter was also signed by some local Quakers who meet in Berkhamsted. On 16th May 2014 the Justice & Peace Group, affiliated to Churches Together in Tring, arranged for Father Antony Paulsamy, the Indian Director of Reaching the Unreached (RTU) to visit Francis House Preparatory School, Tring. Pupils form the school sang for Father Antony and then listened to his illustrated talk. RTU is a UK charity supporting work among orphaned children and poor villagers in a small area north-west of Madurai, in India’s southernmost state of Tamil Nadu. RTU in India is run entirely by a team of Indian staff with its Indian Director. It was in December 2011 that the Justice & Peace Group, Tring raised funds for RTU at the Christmas Concert in Tring’s Victoria Hall, with music and musicians from Francis House Preparatory School and Tring School. There were many entries this year from schools in the UK for the Margaret Demidecka Fairtrade Award 2014, an annual competition open to primary and secondary schools in the United Kingdom for the best Fairtrade project carried out during Fairtrade Fortnight. 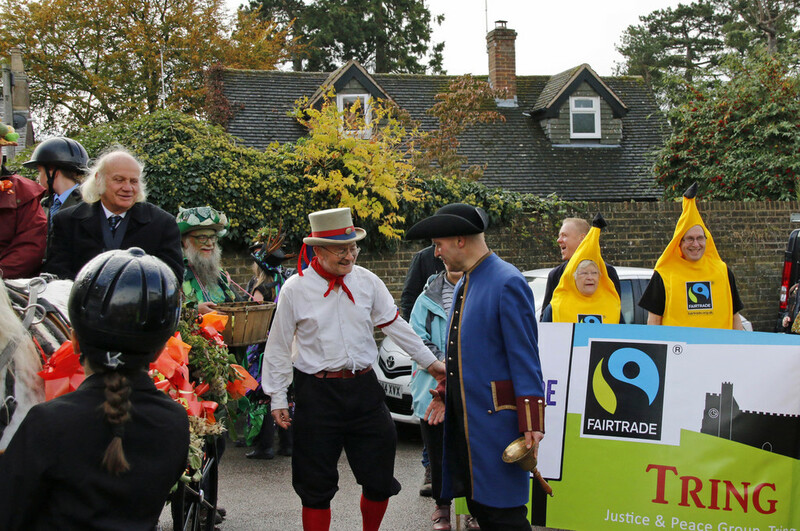 Judging by members of the Justice & Peace Group, together with representatives of the Fairtrade Foundation, took place in Tring. 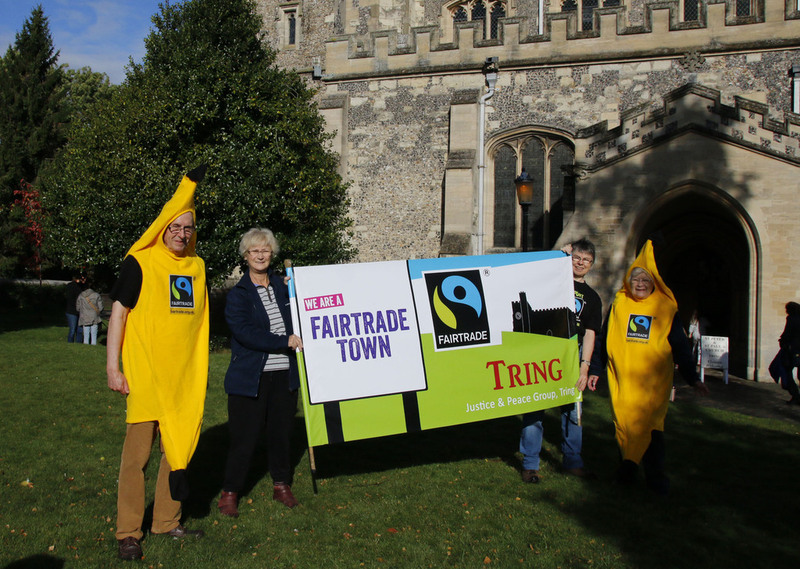 On Saturday 8th March members of Tring’s Justice & Peace Group – the Fairtrade steering group for Tring – were in Church Square, Tring with information about this year’s Fairtrade Fortnight campaign and with details of how our local supermarkets shape up in terms of Fairtrade bananas. 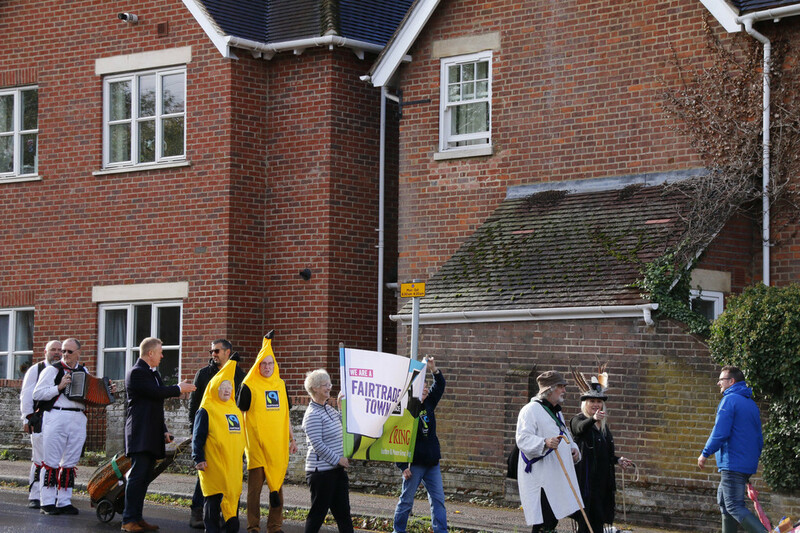 Passers-by were asked whether they bought Fairtrade bananas and were told that while the UK supermarket sector has almost halved the price of loose bananas over the last 10 years the cost of producing them has doubled, trapping many of the farmers and workers who grow them in poverty. Over 30 people completed cards calling on the Business Secretary, Vince Cable, to urgently investigate the grave impact of unsustainable supermarket pricing practices and to act to protect the millions of poor farmers and workers who grow the UK’s favourite fruit. As one of the leading suppliers of Fairtrade products, Traidcraft stock a range of household essentials made from eco friendly materials including recycled tissue products, with proceeds funding overseas producer projects. So buy our environmentally friendly household products today and help blow poverty away! The concert was a sell-out and excellent music and singing was provided by two schools in Tring: from Tring School – Tring’s largest school and the largest secondary school in Hertfordshire – and Francis House Preparatory School, which is for children aged 2 to 11. There were performances by the Tring School Swing Band under the direction of the school’s senior music teacher, Alison Gent, and by the choir of Francis House Preparatory School under the direction of their musical director, Julie Stanley. Reverend Jane Banister acted as compere during the evening. At the end of the evening more than £1000 had been raised, thus enabling Newman Primary School to have electricity for the very first time! For many years this popular Christmas event in Tring was organised by the Tring section of the Salvation Army. Since 2011, following the closure of the Salvation Army Citadel in Tring, it has been organised by the Justice & Peace Group. Each year musicians and choirs from local schools have provided the music, carols and songs. Victoria Hall, Akeman Street, Tring on the evening of Saturday 6th December 2014. The Margaret Demidecka Fairtrade Award was established in 2006 in memory of the late Margaret Demidecka, a founder member of the Justice & Peace Group. The Award in 2006 was initially open to groups of young people with adult team leaders in Tring. In 2007 and 2008 it was extended to groups in the Borough of Dacorum and from 2009 it was extended further to cover all schools within the United Kingdom. It is now promoted by the Fairtrade Foundation, with judging in Tring by the Fairtrade Foundation and the Justice & Peace Group. There is an award for the best entry (showing an event or activities carried out during Fairtrade Fortnight) by a primary school and another for the best entry by a secondary school. 2009: Primary School: St. Ninian’s Primary School, Gourock, Scotland. Secondary School: Worthing High School, Sussex. 2010: Primary School: East Sheen Primary School. Secondary School: Wilden Secondary School, Southampton. 2011: Primary School: Mayville Primary School, Leytonstone, E. London. Secondary School: John Fisher School, Purley. 2012: Primary School: St Swithin’s Primary School, Southsea. Secondary School: Catcote School Business & Enterprise College, Hartlepool. 2013: Primary School: Marlfields Primary School, Congleton, Cheshire. Photo caption: Presentation of the 2013 Award (Secondary School category) to John Fisher School, Purley. 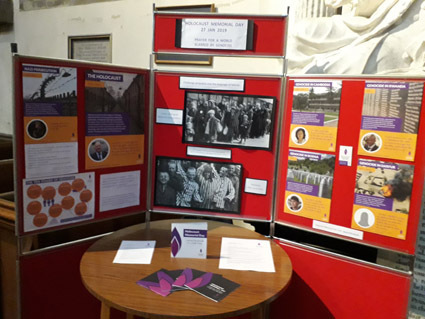 On Thursday 27th June 2013 the Justice & Peace Group, Tring celebrated its 100th meeting with an open event held in Corpus Christi Church Hall. 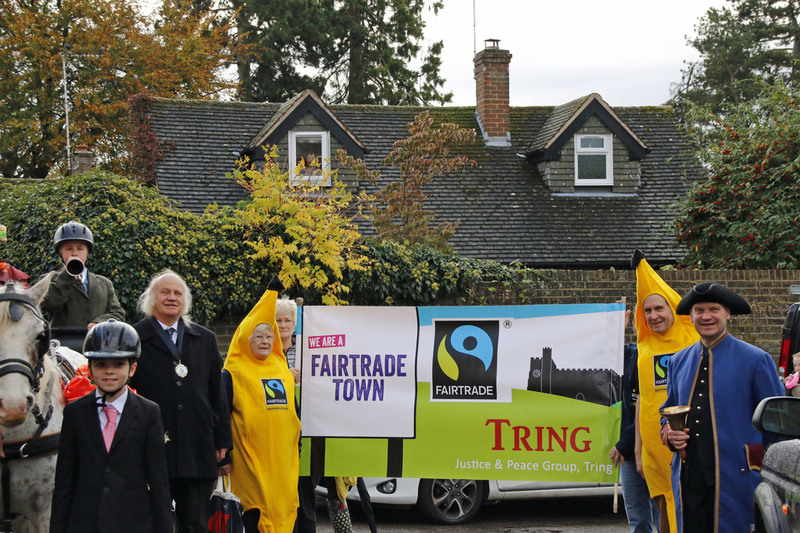 The group showcased the various projects that it has supported over the years, including maintaining Tring’s Fairtrade status. Among the guests attending were Roxanne Ransley – the Mayor of Tring – and Canon Vincent Berry, the parish priest of Corpus Christi. The Group’s current project, assisting with the establishment of a new primary school in a poor rural area of Uganda, was outlined at the event. The Mayor presented a cheque for over £2,000 to Mary Owen (the school’s representative) on behalf of the people of Tring. Mary was also delighted to receive toys and books for the school. Special mention was made of Bishop Wood School in Tring, who raised £50 through a cake sale and who also donated many wonderful toys and books. The children at the school also wrote a letter to the children in Uganda. Hopefully a long-term friendship between the schools will result from this contact. The Mayor presents Mary Owen, a representative of Newman Primary Uganda, with toys and books. Justice & Peace Group members discuss the projects with guests. Pictures of some of the projects the Group has been involved in. Following an appeal for funds and resources to help the Newman Primary School in Uganda, Tring raised well over £2,000 and collected a huge amount of books, toys and sports equipment. The money will be used by the school to fit much-needed windows, doors and floors to 4 classrooms. The young pupils of Newman Primary are very grateful to everyone in Tring who donated money, equipment and their time. It will make a big difference to this new school. Every year our Group identifies a project that needs support. We choose a local or an overseas project in alternate years and in 2013 the establishment of a primary school in Nyamirama, Uganda was our overseas project. The school serves a very poor and deprived area where no primary education was previously possible. It opened – on 4 February 2013 – with 242 pupils, although it is still being built. The children are also in dire need of toys, books, sports equipment and teaching resources. A container left the UK for Uganda in July 2013 and was filled with materials that the school can use.